15. Emblems with letters (32) Note: Only one per character. 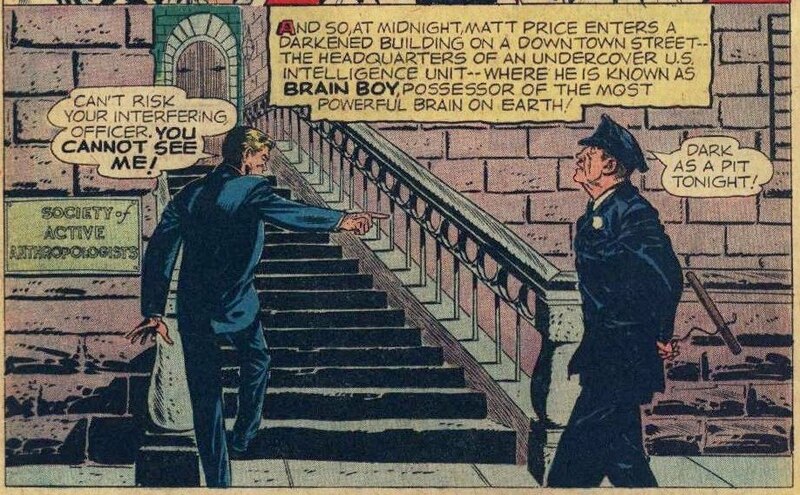 I took a few out because they seemed too easy; almost every issue of Detective from about 1960-1963 featured Robin in profile as Mark Engblom documented a couple years ago. Some ground rules: DC titles, as per Weisinger's requirement. Since Action #355 was the July 1967 issue, no comics after that date. 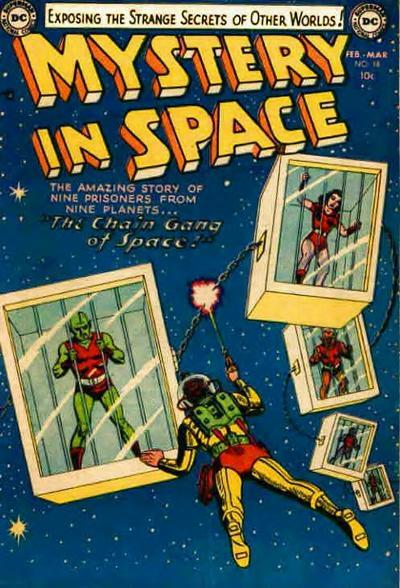 And since you can use sources like the GCD for your covers, no comics published before 1955. For the heck of it, here is my stab at #14, chains and shackles. 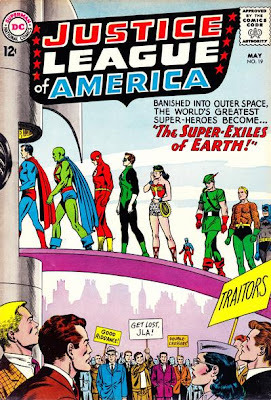 Some other cover types that were probably common in the DC Silver Age: Apes, duplicates of the heroes (many, many, Wonder Woman covers featured this theme), fat and/or excessively tall characters. 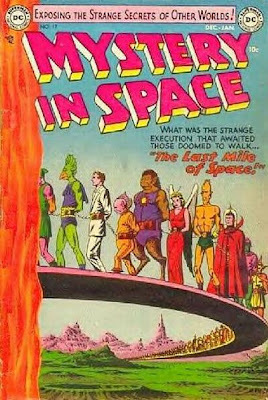 I have not read any of them, but I have read many of the Fletcher Hanks stories in Fantastic Comics (the subject of the "I Shall Destroy" and "You Shall Die" books). Mark Engblom reviewed the former book here. I can certainly attest that the Stardust stories are every bit as demented as Mark indicates in his review. They are wildly entertaining and completely insane. 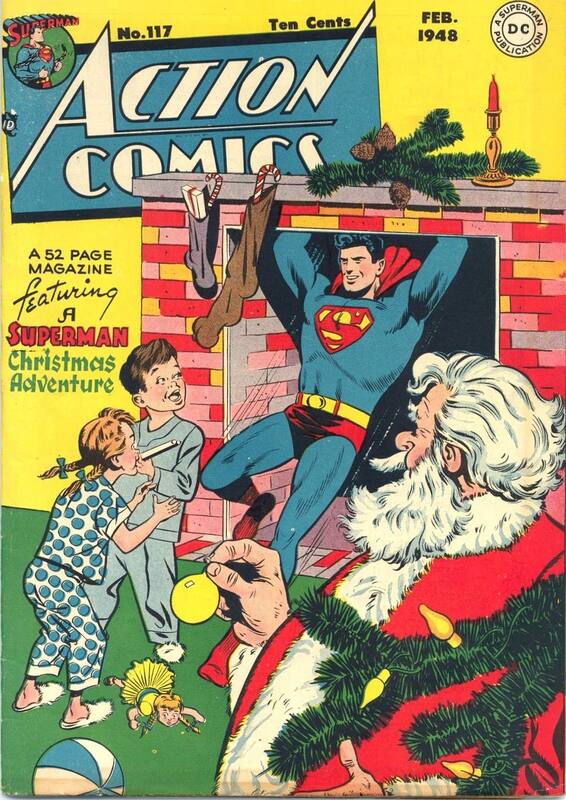 Merry Christmas From Silver Age Comics! 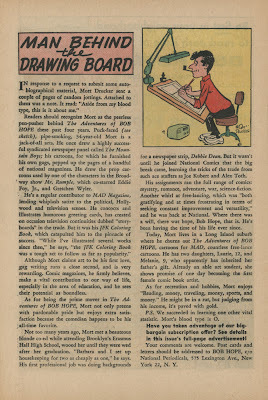 Of course, the bit about his daughter becoming the first female comic book artist would be news to Ramona Fradon and Marie Severin. Superman Fan posts about a girl's Superman outfit that was advertised in DC comics in the mid-1950s, along with the boy's outfit. As you'd expect, the girl's version featured a skirt. At this point, we’re still four years out from Kara Zor-El’s debut (in Action Comics #252), and three years away from the “Super-Girl” Jimmy Olsen creates with a magic totem in what would seem to have been a dry run for the character (in Superman #123). Kara’s outfit featured a blue skirt while her precursor had a red one. 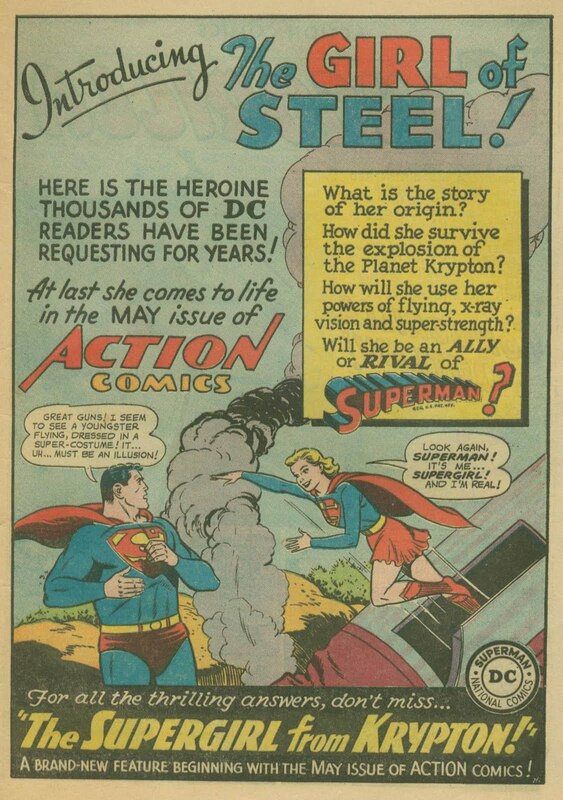 (In Action Comics #156, temporary Superwoman Lois Lane had it both ways; red on the cover, blue inside the book). Personally I thought the red skirt was better. 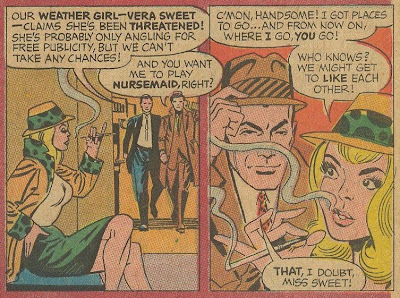 And I'm sure if anybody wrote to Mort Weisinger about this "boo-boo", his response was probably that like all women, Supergirl had more than one outfit. 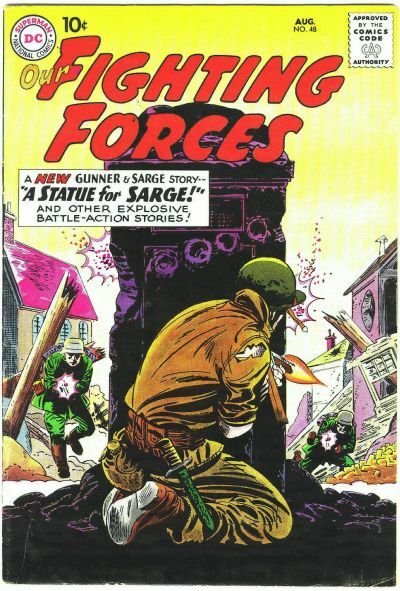 GI Combat was one of the titles that DC inherited from Quality Publications in the late 1950s. As with their other war titles, DC created a continuing feature for the book. In this case, it was the Haunted Tank. During World War II, the US forces used a tank known as the M3 Stuart, named after the Confederate General, J.E.B. Stuart. In this series, the Civil War cavalryman haunts the tank named after him and which is commanded by a Jeb Stuart Smith (later stories dropped the last name). The series mostly had the ghost giving cryptic and apparently crazy advice to his namesake, which later would be revealed as prescient. Smith's men were a little disturbed by his habit of talking to a ghost, but generally reasoned that he seemed to be a fine commander despite his eccentricity. 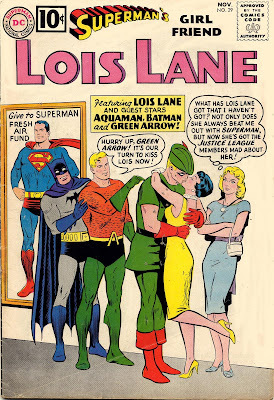 DC ran PSAs (Public Service Announcements or Ads) in their magazines for many years. 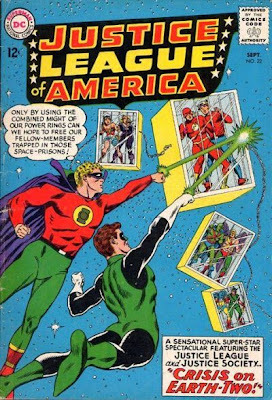 I'm not sure exactly when they started but it appears that they ended around July 1967; I was unable to locate any in Silver Age comics dated August 1967 or later (although I remember that DC had a similar series of ads in the 1970s called "Justice for All Includes Children"). 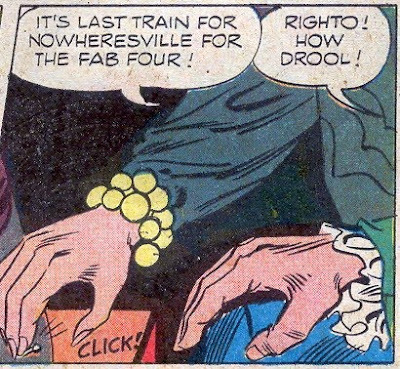 But up until then, they appeared in almost every comic book DC published, with only occasional exceptions. I did some research on these over the last few days. 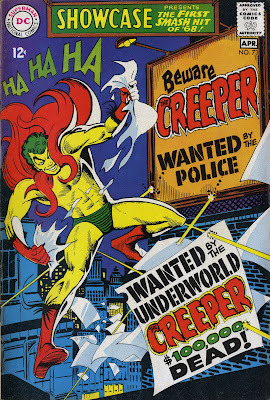 The PSAs were very organized, to the point where you could probably identify the month of publication of a comic missing the outer wraps just by checking what PSA appeared in it. 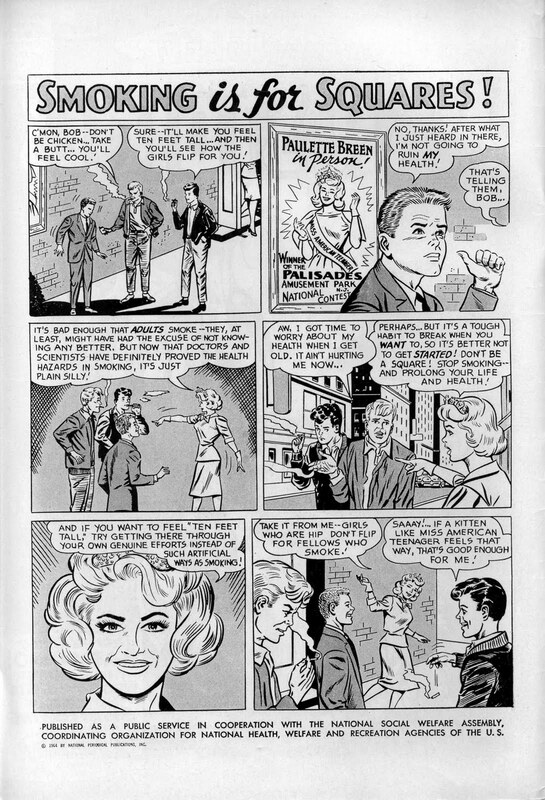 The monthly and eight times a year magazines all had the same PSA based on the cover date, while the bi-monthly mags all had PSAs based on the month prior to the cover date (i.e., Oct-Nov 1963 magazines would have a November cover date and the October 1963 PSAs, while Nov-Dec 1963s would have a December cover and the November 1963 ad). 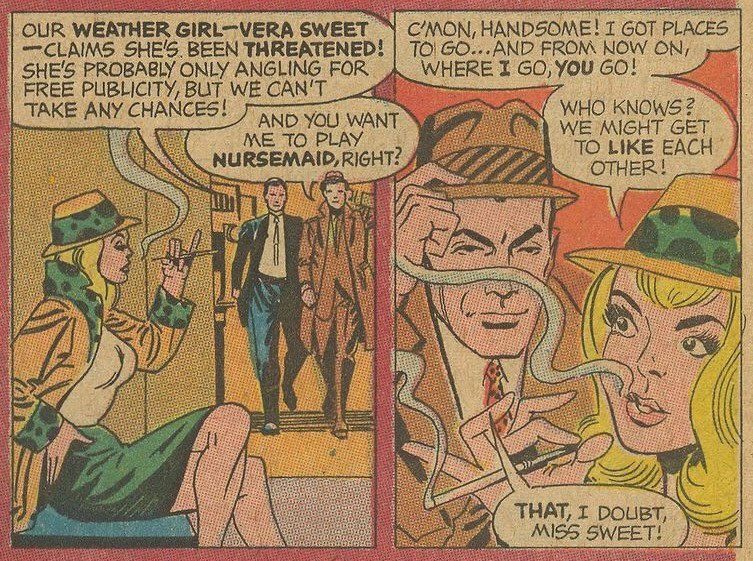 There was, however, one big exception: None of the romance comics published by DC carried the ads. 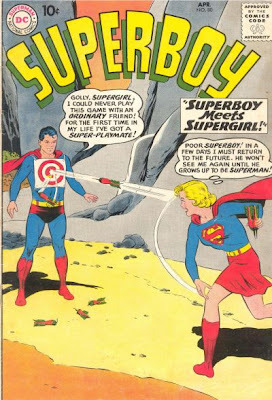 My guess is that DC felt the readership of their love mags would be turned off by the ads, which were mostly aimed at young boys. 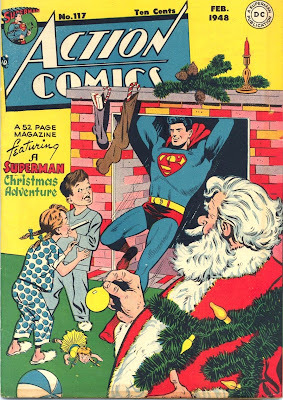 Some of the PSAs featured DC characters, such as Superman and Batman. 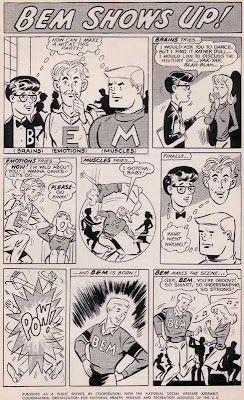 DC's teen characters Buzzy and Binky popped up in quite a few ads, and as the series based on those characters had often ended years before it was often puzzling to readers. Just who was this kid Allergy? 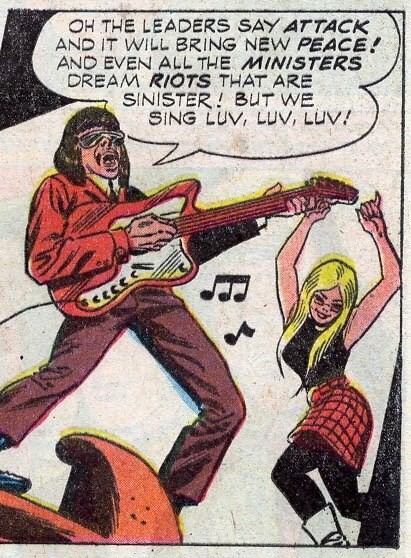 And why was Wolfie such a nasty little weasel? That appeared in October 1964, shortly after the Surgeon General's Warning first started appearing on cigarette packs. Hence the bit about adults not knowing any better. The Health Myths Debunked ad convinced me to get a tetanus shot after I stepped on a nail one time. Some of the ads appeared more than once. 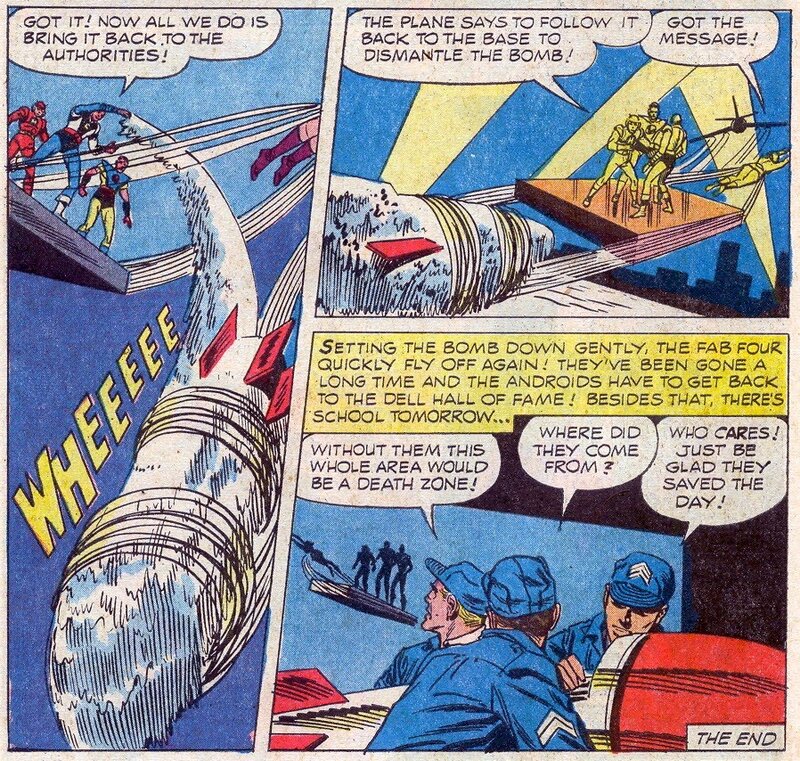 According to several sources, the ads were written by longtime DC editor Jack Schiff and drawn by Bob Kane's ghost on Batman, Sheldon Moldoff. 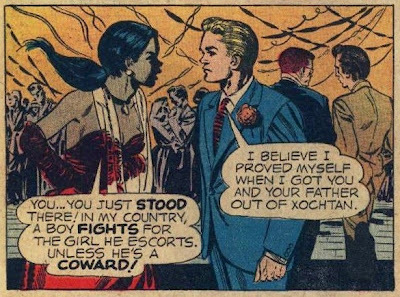 Only one PSA that I was able to locate had text-only; this was the Big Dance, which appeared in many DC magazines in September 1956. It's about two teenage girls, who are bummed out that their parents have set a curfew for them to be home. To their surprise, they learn that their boyfriends (apparently a year or two older) also have a time limit. Aug 1957 Earn While You Learn! Mar 1958 Do You Know What's Behind a Law? Jul 1958 Are You a Litterbug? May 1960 What's Wrong with These Pictures? May 1961 How's Your Eye-Q? Apr 1962 Do You Know Your Neighbors? Jun 1964 Are You a Good Neighbor? Apr 1965 Are You a Silent Witness? May 1965 What's Wrong with These Pictures? Oct 1965 Are You a Litterbug? I also liked How Not to Enjoy a Vacation, with the family pet describing the misadventures his owners had on a summer trip, and Honesty is the Best Policy, about three boys who find a wallet in a phone booth. 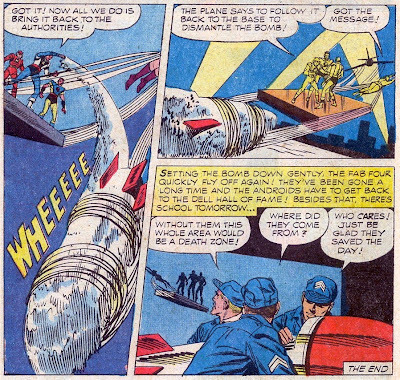 As far as I know, none of the other comics publishers did anything similar during the Silver Age. Update: More discussion of the PSAs here. Commander Benson has a terrific trivia challenge for Silver Age fans. Off the top of my head I can get four answers out of ten (1,6,9 and 10) and have a pretty good guess at 4 and 5. I'd know where to look to find the answers to 2,4 and 8. 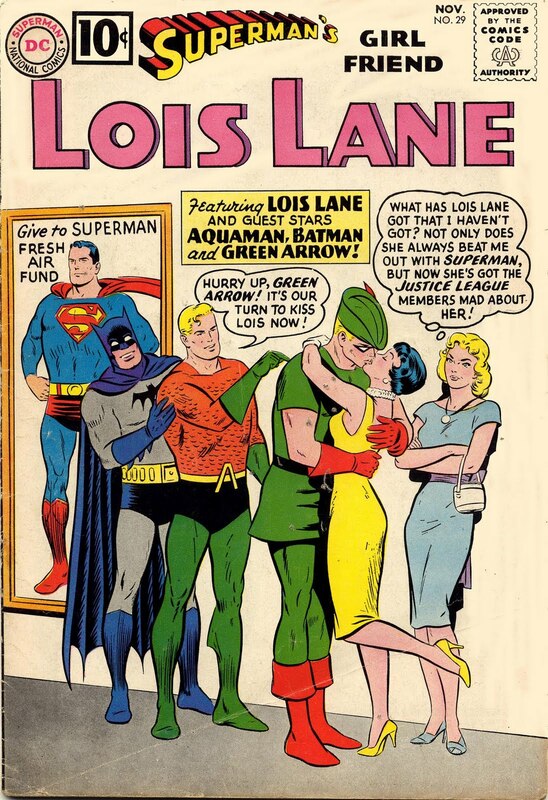 Only #3 has me currently baffled; might want to bone up on my World's Finest issues. Great job; as the Commander notes, coming up with challenging questions is a chore in the age of Google. Booksteve has a post covering all the Craig Yoe books for this year, which is quite a prodigious output. Great for last-minute holiday shopping for your comic fan friends and relatives! 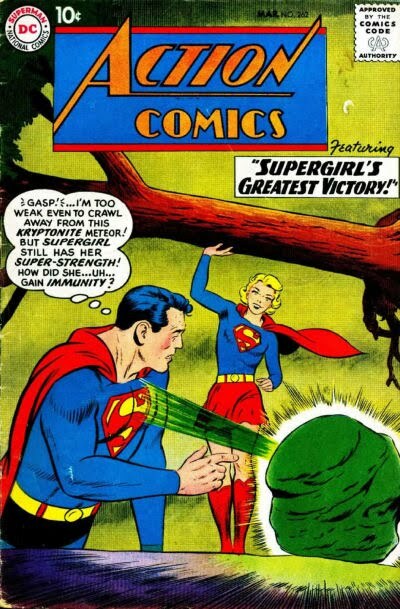 Blog into Mystery covers the time that Supergirl got Jimmy Olsen fired in a version of Standard DC plot #6b: Someone looks into future, learns that someone else will die, and does amazingly convoluted things to try to prevent it. I can think of four other examples of this plot, including the famous story where Lightning Lad first died. Over at Nothing But Batman I have a pretty long look at the romance between Batwoman and Batman during the Silver Age. 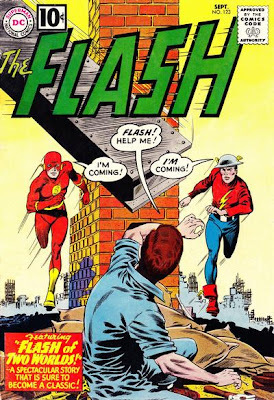 Some obvious similarities there; the central figure, the two people speeding towards him with an object between them so they can't see each other. It has the same key elements, but one major thing is different; there's no particular reason for the two German soldiers not to know about each other, whereas in the other two covers, there is obviously quite a surprise awaiting the two men who are on a collision course. 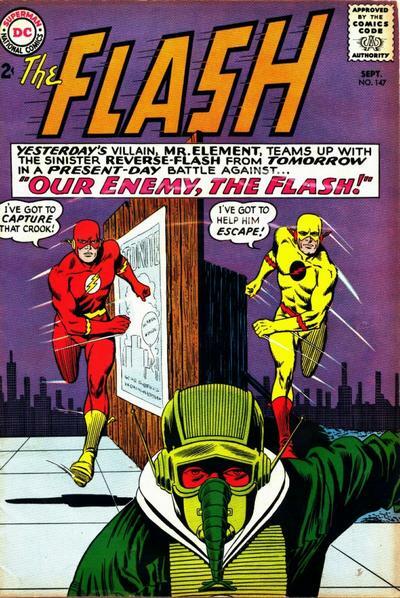 It's interesting to note that the scene shown on the cover of Flash #123 has little to do with the plot. Indeed, it seems shoehorned in the story just to justify that image. 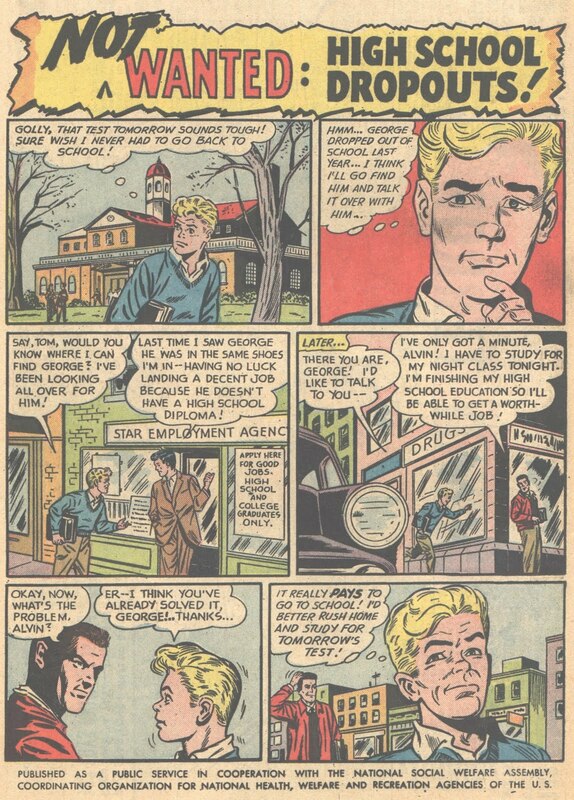 Barry and Jay are actually aware of each other in that sequence, even though it doesn't appear that way. In Flash #147, on the other hand, it comes as a big surprise to both the Flash and Professor Zoom to bump into each other. 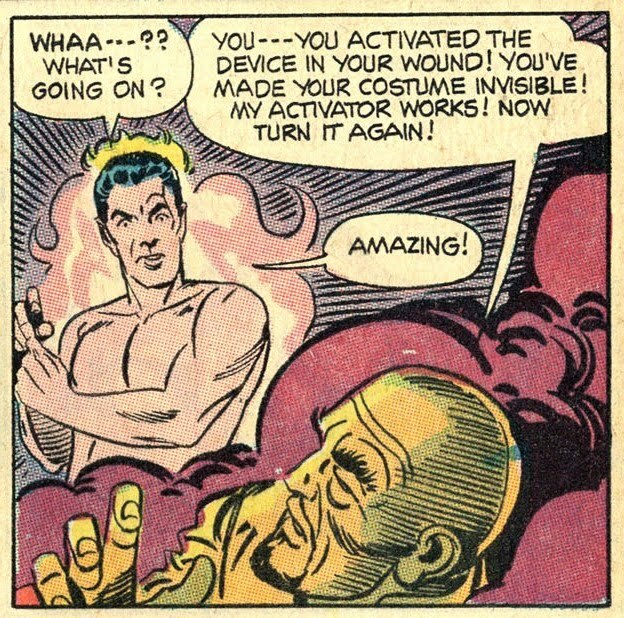 As the 1960s wore on, the superhero craze showed no signs of abating. 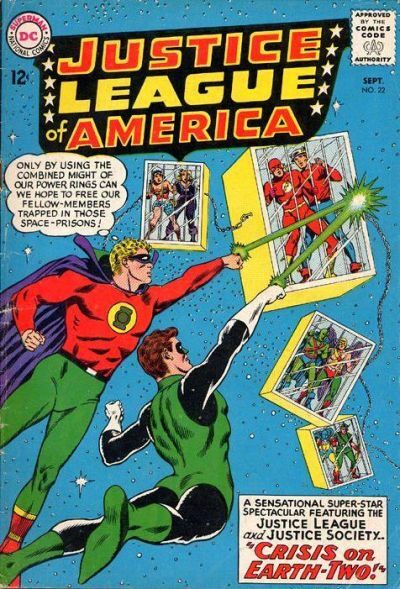 DC, the only comic publishing company that had never ceased publishing superhero comics, nearly doubled their output of the men in capes and cowls from about 25% of their books in the 1950s to about 45% in the 1960s. 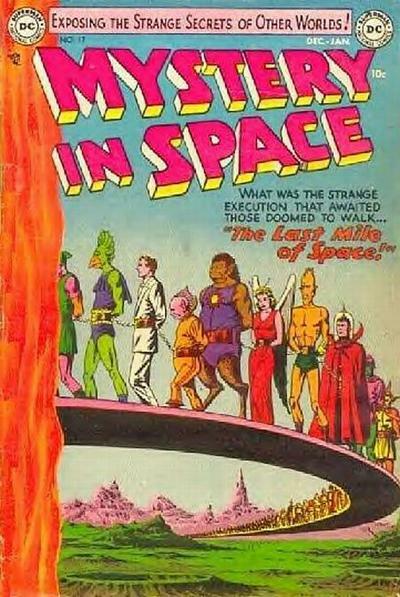 Marvel, which had no superhero titles from about 1955-1961, suddenly was swarming with amazingly-powered characters. And then came Batmania, and it seemed like nothing sold except superhero titles. So Dell, which had only made a few half-hearted attempts at the genre, leapt in with this rather lame effort. Even the comic's title seems generic: Superheroes. "A Fantastic Transformation into Reality?" 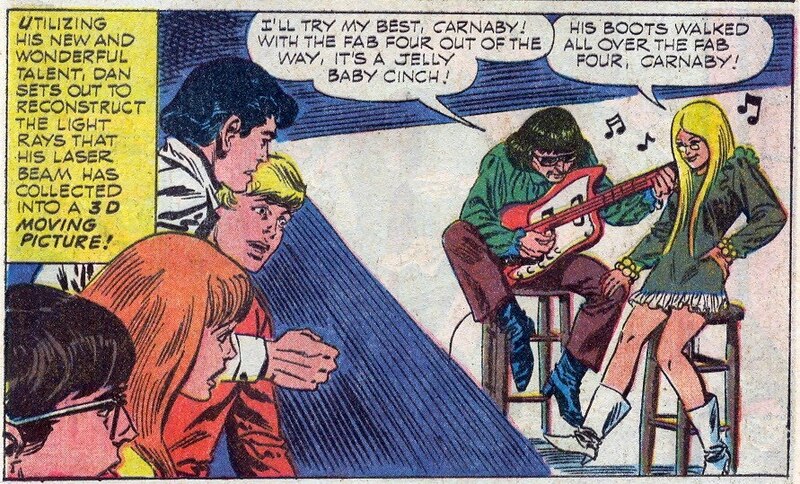 And the Fab 4 were the Beatles. 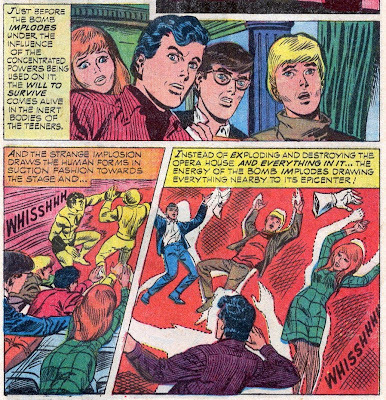 We quickly learn that four "teeners" are able to control a quartet of super-powered androids. One guy can receive radio waves; a very useful ability. 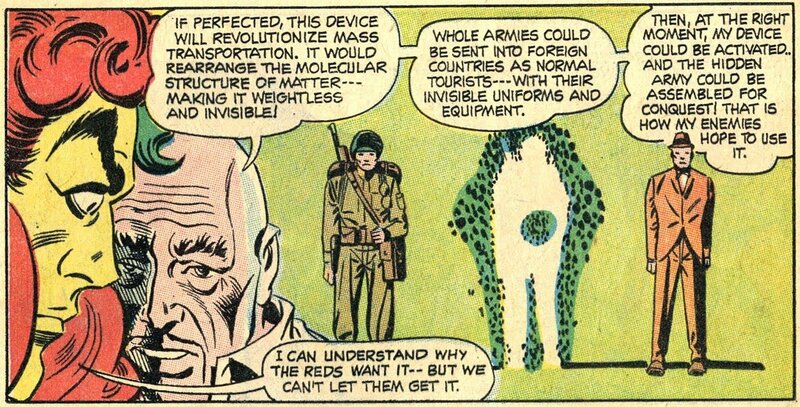 Of course, you could just bring along a portable radio instead. 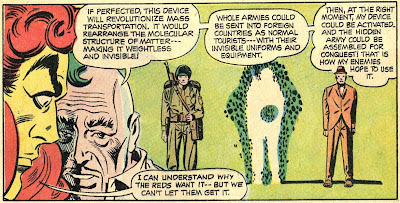 Another guy has built-in radar, which proves handy considering that the story is about a bomber plane from SAC (Strategic Air Command) being hijacked by hypnotic command. Polymer Polly can fly and create strands of polymer from her body, while Crispy can shoot cold rays from his fingers. As a result, the kids now have the powers that they formerly had to use the androids in order to possess. It's ginch-tastic! The Fab 4 quell the mob, and eventually catch the Mod and his girlfriend. Comments: Painful. 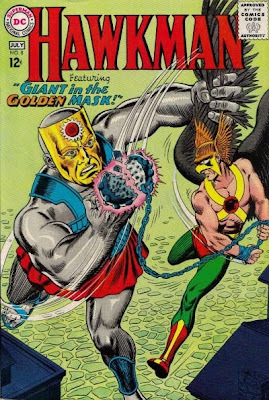 About the only thing positive in this effort is the artwork (credited in the book to Sal Trapani, but actually penciled by Bill Fraccio and inked by Trapani per Martin O'Hearn in the comments). The script glosses over all sorts of plot-holes, then maddeningly screeches to a halt so the kids don't walk out of Polly's house dressed in their uniforms. Never mind that earlier it's Tom's house. The story tries too hard by half to be relevant to kids of the time--why Tom even produces a comics fanzine--but fails miserably. 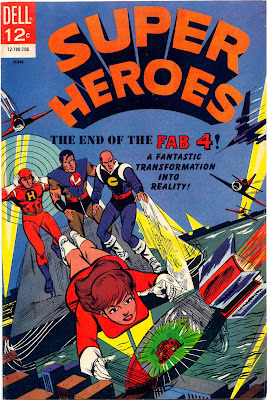 It is plain to see why this was the last outing for the Fab 4. Was There A Plan "C" for Clark? 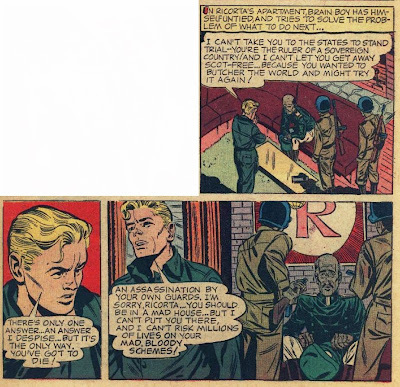 I linked a week ago to Again With the Comics' post on the Helmet of Hate story in Jimmy Olsen. As you will recall from reading that post, at the end of the story it was revealed that the entire plot was based on Plan "J", a pre-arranged scheme where Jimmy Olsen was to do certain things to help out Superman. 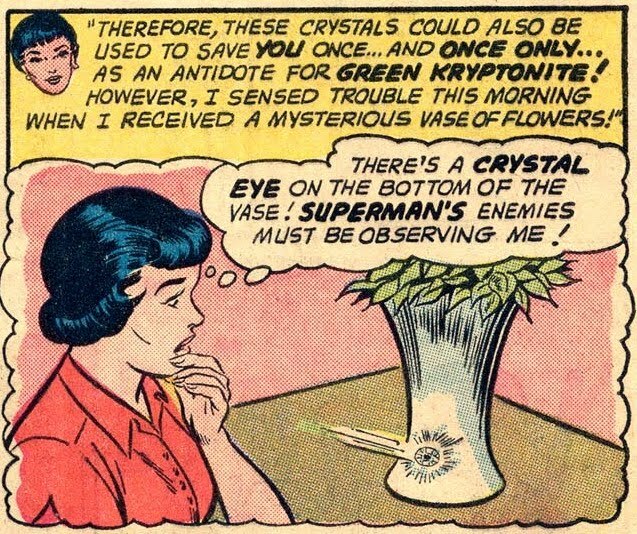 Note to self: When planning to keep tabs on Lois Lane, make the crystal eye a little less obvious. 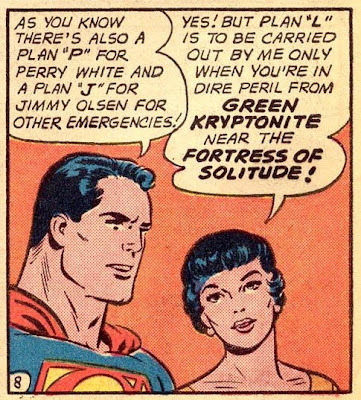 Plan "P", for Perry White appeared in Action #295, discussed in detail at the Silver Age Sage. 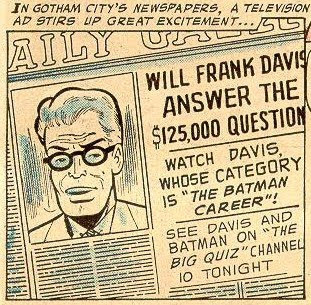 In the mid-1950s, TV viewers were riveted to their screens by the Quiz Shows of the time. However, in 1958 it was discovered that some of the shows (notably Twenty-One) were rigged, with the producers providing the contestants the answers and coaching them on how to make the show more dramatic. The story was immortalized in the 1994 film on the scandals, Quiz Show. 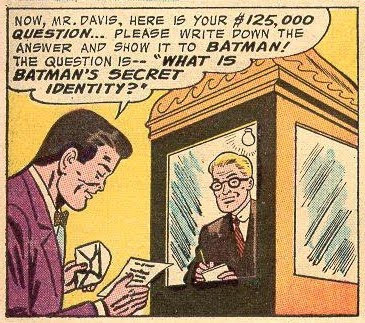 And even more startling, Davis has apparently deduced the answer, as he writes Bruce Wayne's name on a card and shows it only to Batman. 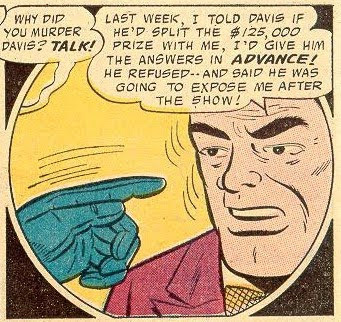 However, before Davis can exit the isolation booth, he keels over and dies. And when they pull him out, the pad on which he wrote Batman's secret identity is blank; it appears that someone tore the top sheet off. Harmon (the game show's host) had coated the light bulb in the isolation booth with a chemical that turned into a poisonous vapor when heated. Ironically, the vapor also erased the handwriting on the pad, thus saving Batman's real identity. The gravy train derailed in August and September of 1958 when disgruntled former contestants went public with accusations that the results were rigged and the contestants coached. First, a standby contestant on Dotto produced a page from a winner's crib sheet. 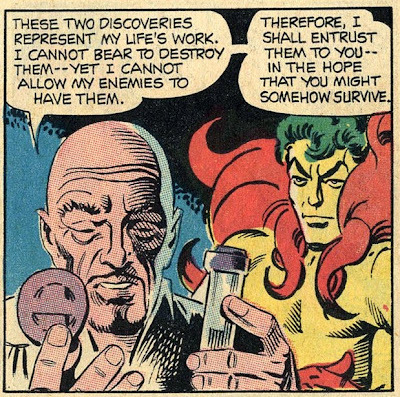 Then, the still bitter Herbert Stempel, Van Doren's former nemesis on Twenty One, told how he had taken a dive in their climatic encounter. When Enright subsequently told him the promise couldn't be kept because he had sold his shows to NBC itself, Stempel went to the authorities to explain how the show was fixed and his own role in the rigging. As he later testified to Congress, he also agreed to talk to a reporter from the New York Post in February 1957, but the paper feared a libel suit if they went public with Stempel's original accusations at the time they spoke. 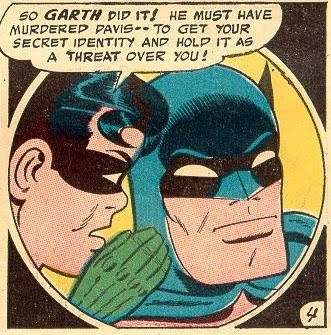 However, when we consider the timeframes for publishing comics, it seems unlikely that the scandal could have been public knowledge at the time the Batman story was written. According to the Master List for DC maintained at DC Indexes, Batman #108 hit the newsstands on April 16, 1957. 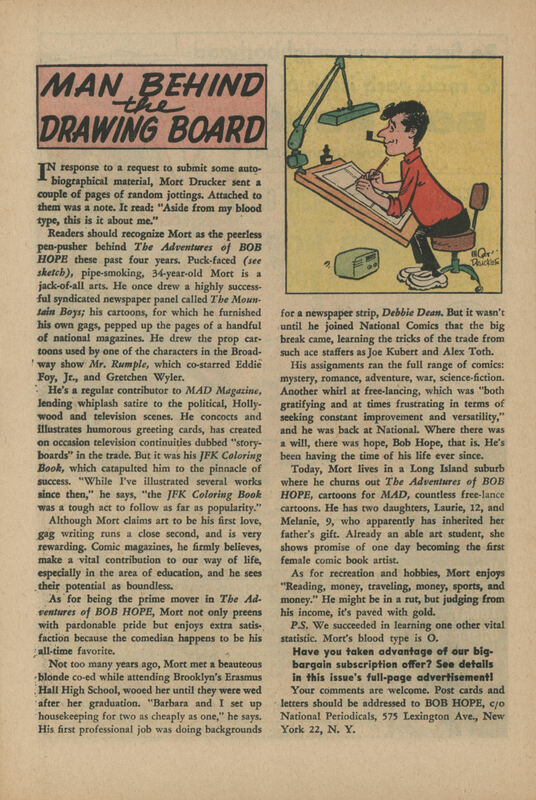 Given the several months' delay between creation of a comic and its actual publication, it appears likely that the story must have been written prior to Stempel's talk with the New York Post. Note as well that the scandal did not become public at that time as the Post did not run with it. The GCD does not have a credit for the script on this story. 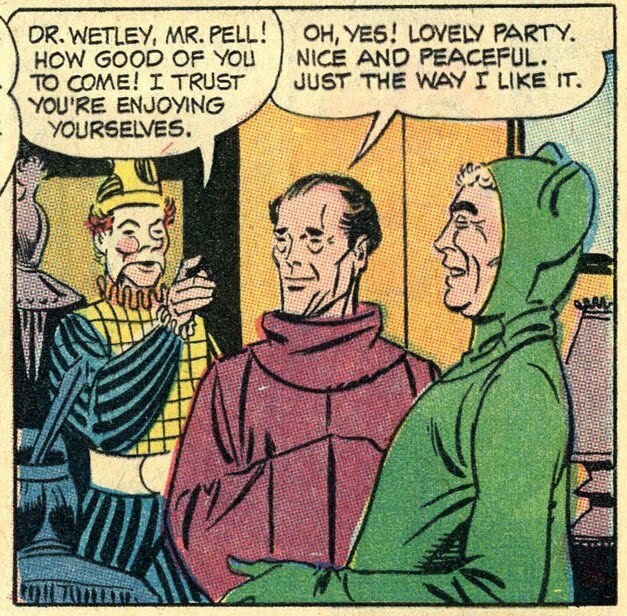 I have a vague memory that one of the famous comic book writers appeared on one of the quiz shows of the 1950s. Anybody? Bueller? Some very funny commentary by the host there. 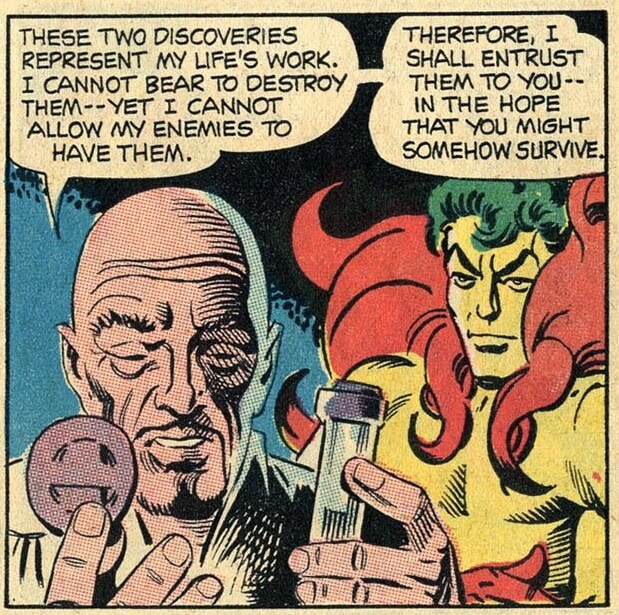 Of the two, I'd say the Question is more interesting, as his character is even more uncompromising than the Creeper, and more of an exemplar of Ayn Rand's philosophy of Objectivism. 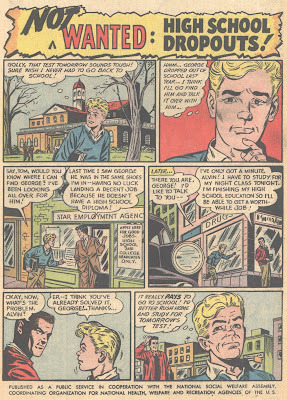 Ditko was allowed to script his Charlton tales, while at DC his scripters included Don Segall (in the Showcase debut) and Denny O'Neill (in the ongoing series). 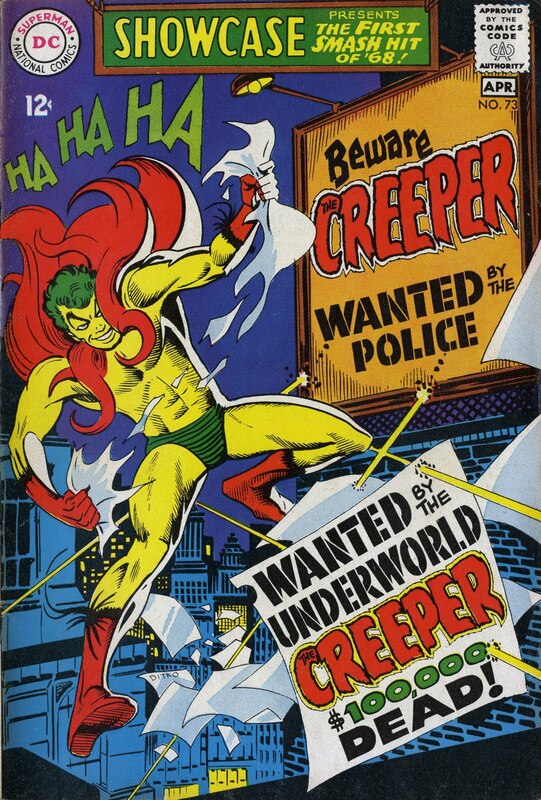 The Creeper had only a short run at DC (six issues), although he made several guest appearances in the 1970s and has been a background character (as TV host Jack Ryder) for decades since. He had another short series in the mid-1990s. In 2003, Vertigo put out a mini-series with a female version of the Creeper set in 1930s France.